Bank of Montreal (BMO) provides various retail banking, wealth management, and investment banking products and services in North America and internationally. It has operations in the US, in the form of BMO Harris Bank. Bank of Montreal has paid dividends since 1829. 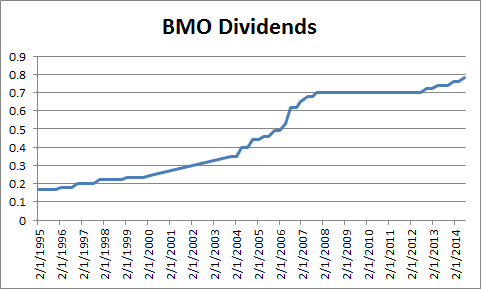 Over the past decade, Bank of Montreal has increased dividends per share by 5.90%/year. And that’s despite the fact that the annual dividend was left unchanged in 2009, 2010 and 2011.Earnings per share have increased by 4.10%/year over the same time period. The bank sells for 12.50 times earnings and yields 3.80%. The Bank of Nova Scotia (BNS) provides various personal, commercial, corporate, and investment banking services in Canada and internationally. It operates in four segments: Canadian Banking, International Banking, Global Wealth & Insurance, and Global Banking & Markets. This is the most international Canadian bank, as it has services in Caribbean, Latin America, Central America, and Asia. Bank of Nova Scotia has paid dividends since 1834. Over the past decade, Bank of Nova Scotia has increased dividends per share by 7.50%/year. And that’s despite the fact that the annual dividend was left unchanged in 2010. Earnings per share have increased by 7.10%/year over the same time period. The bank sells for 12.40 times earnings and yields 3.80%. Canadian Imperial Bank of Commerce (CM) provides various financial products and services to individuals, small businesses, and commercial, corporate, and institutional clients in Canada and internationally. The company operates through three segments: Retail and Business Banking, Wealth Management, and Wholesale Banking. Canadian Imperial Bank of Commerce has paid dividends since 1890. 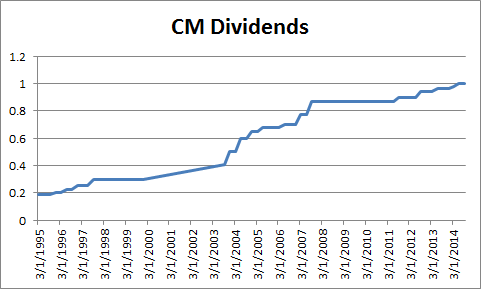 Over the past decade, Canadian Imperial Bank of Commerce has increased dividends per share by 4.40%/year. 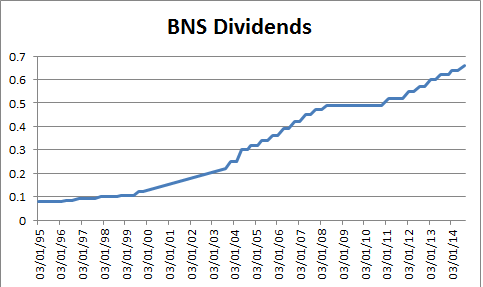 And that’s despite the fact that the annual dividend was left unchanged in 2009 and 2010. Earnings per share have increased by 4%/year over the same time period. The bank sells for 11.30 times earnings and yields 4%. Royal Bank of Canada (RY), a diversified financial service company, provides personal and commercial banking, wealth management, insurance, investor, and capital markets products and services worldwide. This is another bank that has operations in the US. Royal Bank of Canada has paid dividends since 1870. 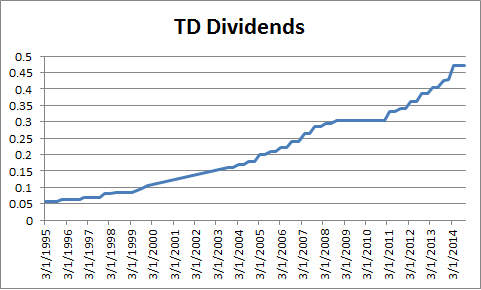 Over the past decade, Royal Bank of Canada has increased dividends per share by 10.60%/year. And that’s despite the fact that the annual dividend was left unchanged in 2009 and 2010. Earnings per share have increased by 11.10%/year over the same time period. The bank sells for 13.20 times earnings and yields 3.50%. The Toronto-Dominion Bank, (TD) provides financial and banking services in North America and internationally. The company also has significant operations in the US. The Toronto-Dominion Bank has paid dividends since 1857. 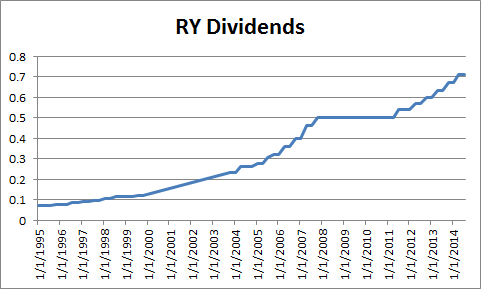 Over the past decade, Royal Bank of Canada has increased dividends per share by 10.10%/year. And that’s despite the fact that the annual dividend was left unchanged in 2010. Earnings per share have increased by 9.70%/year over the same time period. The bank sells for 11.30 times earnings and yields 3.80%. Overall, I like the fact that Canadian Banks didn’t cut or eliminate dividends during the 2007 – 2009 financial crisis. Instead, they kept them steady for a few years, and have been increasing them for a few years now as well. I don’t believe this was due to dumb luck, but because there were stricter lending practices, than what we had in the US prior to the Great Recession. In the grand scheme of things, I am bullish on Canada in the very long-term. An investment in all banks is a bet that Canada will be a developed country in 30 – 40 - 50 years (after that – I don’t care). It is a bet that its economy will gradually grow over time, the number of people will increase, and that Canadian people and businesses will need the services of a financial institution. I think that the Canadian government has its house in order, and that the relatively more open immigration system will encourage faster population growth. It seems that most of the banking in Canada is done through one of those five largest banks. There are a few smaller ones, but I chose to only focus on the larger entities. Once a consumer starts using the services of one of the banks, they get used to it, and the switching costs are high. Once you establish that relationship with the bank and a banker, chances are that you will do checking through it, manage your investments, use credit cards and take on loans like car or mortgage on a house. Therefore, I believe they have competitive advantages, and scale of operations. That being said, I have no idea whether there will be a financial crisis in Canada in the next 5 – 10 years. It is possible that one of the largest five banks fails during the next major recession. That’s fine, because the ones left standing will pick up the business and do better. This is why I am putting equal amounts of investment in each bank. No matter how the economy does, banking needs to get done, meaning that one of those five banks will get business. Again, as a long-term investor, my holding period is in the decades. I know growth is not going to be smooth year over year, which is why I am fine with encountering bumps along the road. This will help me build out my positions at cheaper prices. It is also possible that earnings on those banks do not do that well over the next decade. That’s fine, since I am essentially getting paid anywhere between 3.50% and 4% annually to hold on to those banks. I think that even if earnings do not grow that much, dividends per share will grow enough to maintain purchasing power of my income. This is why I am slowly putting money once per year in those banks, in case I get the timing of the purchases wrong. Actually, even if I get the timing wrong in the next five years, that’s ok. It is ok, because I am investing for the next 30-40-50 years, not for the next five months. I have a conviction behind those ideas, which is why I would not hesitate to average down, if prices are much lower than today come 2015.